Following the phenomenal success of the British spectacular The King’s Speech at the Oscars, Baldwin’s latest auction consignment couldn’t have come at a more appropriate time. 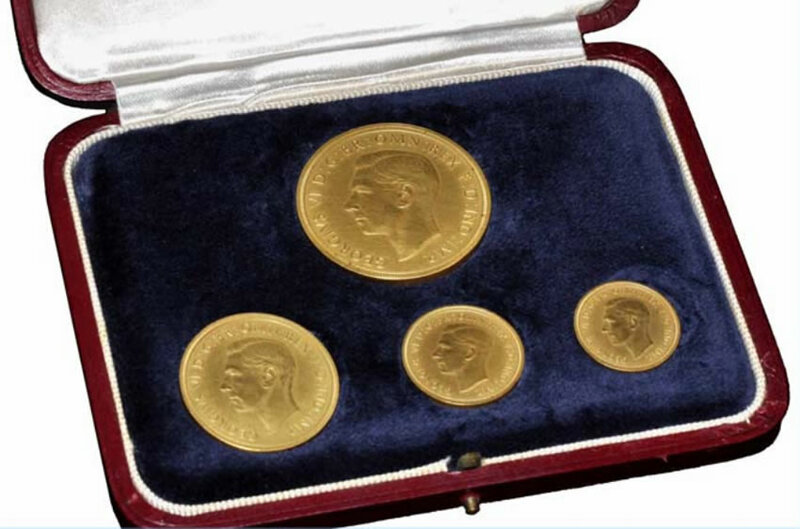 The set, which carries a weighty estimate of £90,000 — 110,000, is one of only two known sets struck with an experimental matt finish specifically to be used for pre-production promotion of the coins minted by the Royal Mint to commemorate the Coronation of the King in May 1937. In 1936, when the new designs were in gestation, numismatic photography was in its infancy. The reflective properties in the gold metal used to mint coinage made it impossible to generate a clear image of each coin. The Royal Mint successfully experimented with matt finishes produced from a sand-blasting process to generate these pre-production coins which were used to advertise new coins to the public. This set would have been one of the first to be produced solely for that purpose. One of only two of its kind known to exist in private hands, the case housing the coins has a black velvet pad, inverse in colouration to the normal cream used for brilliant proof sets in 1937. Unlike its counterpart (illustrated individually in Wilson and Rasmussen), this beautifully preserved set has its original and unusual case intact. (a) We have examined the set of George VI coins and we are satisfied they [sic] they were given the matt finish before issue by the Mint. The matt finish is given to each coin individually by very fine sand-blasting and as the process is very laborious it would not be practicable to apply the treatment on any but a very limited scale. None of the 5,500 sets made available to the Public was treated in this way and it must be assumed that your set was specially prepared for a particular occasion of which a record no longer exists. The extraordinary series of events leading up to the coronation of King George VI is well documented. Following the death of King George V on 20th January 1936 the Prince of Wales succeeded as King Edward VIII and a coronation date was set for 12th May 1937. According to George V’s official biographer, Phillip Ziegler, George V was said to have had reservations about his sons suitability as king and was hopeful that, the then unmarried, Edward would not have children and he would be succeeded by his younger brother Albert. A little over a year later Prince Albert, Duke of York would become the 29th King of England when Edward VIII abdicated the throne after a brief 325 day reign. Edward had an unorthodox approach to his role as King, attracting criticism from wider political circles for what was considered interference in political matters. His open relationship with American born Wallis Simpson, a divorcee who was in the process of divorcing for a second time, was deemed as morally unacceptable and led to his abdication on 10th December 1936. Edward and Wallis later married and became the Duke and Duchess of Windsor. In the wake of the royal scandal Price Albert reluctantly took the throne, taking the name George in honour of his father. George VI is now well know for his speech impediment, apparent in the early recordings of his public speeches, which has become the storyline for this years BAFTA and Oscar award winning film, The King’s Speech. The stammer plagued him in his role as a public speaker throughout the first ten years of his reign. He sought ongoing help from the Australian speech therapist, Lional Logue, and eventually overcame his affliction. King George and his wife, Queen Elizabeth, became a well loved Royal couple, famously refusing to leave the environ of Buckingham Palace during the Blitz, even when it was bombed. "This is a fantastic and unequivocal opportunity to acquire the rarest gold numismatic item of the reign of King George VI. There are no other proof British gold coins of George VI as rare as these. This set has not been offered at a UK auction in decades, and its significance to numismatists in the history of our Nation’s coinage is immeasurable"
Baldwin’s May auction will be held on the 3rd-4th May at the CIPFA Conference Centre in London. Established in 1872 A. H. Baldwin & Sons Ltd (http://www.baldwin.co.uk/) has over 100 years experience in servicing the numismatic industry. Although founded much earlier, the name A.H. Baldwin & Sons didn’t become synonymous with the London numismatic scene until 1901 when Albert Henry set up his first London based premises on Duncannon Street with his eldest son Percy, joined later by his two other sons Fred (legendary cataloguer of King Farouk of Egypt’s coin collection) and Roy. Baldwin’s auction department was established in 1993 and has grown to hold between ten and twelve sales annually in London, New York, Hong Kong and Dubai and specialize in all areas of Numismatics. 1937 Gold Sovereign Matt Proof Set is the collection fit for kings and queens. So it will be great see these coins be graded and slabbed by PCGS or NGC?Therefore it will be wonderful see 4 Gold Coins be graded and slabbed by PCGS or NGC! I am a travel agent in Illinois, USA and have a passenger traveling to London in June and is a very avid coin collector and is wanting to find a 1937 Proof King George VI (13 coins) not gold (including the moundy coins while he is in London. If you have such a collectable or know where he might search, please email me back. We appreciate your help and wish you a good day.